I also want to add that a leader is differentiated from a manager / supervisor / boss / owner in that the leader is primarily grounded in the competence and preference in dealing with human beings. Let’s unpack a few definitions in this statement. Totally present, meaning that this type of leader has the innate ability to show up fully awake, attentive, and mindful of themselves and others. Most of us spend almost all our waking moments trapped in repetitive thinking about some past or future event, handcuffed from accessing our higher abilities to fully function at our best. Too often our best selves are hijacked by some emotional trigger that lingers and negatively affects the way we deal with others. Authentic leaders are those who are mentally, emotionally and spiritually available to what is going on right now, and through the power of that presence they are able to help others get present, get clear, and to be open in dealing with things with less distress and more ease. Think for a moment when you have had the sense of being totally focused in the present moment, or been in the company of others who were, and of the positive energy that flows into dealing with whatever severity of pressure you were facing – my guess is those outcomes were far superior than the normal ones our less-conscious, reactive, conditioned-self outside that state of presence would have delivered. To the needs and situation, means in essence being all-in right here, right now, to the people and things that are right in front of you in the situation at hand. Too many times people in positions of authority react negatively when things go wrong, due to their focus on the negative outcomes of some future possibility like failure or being judged harshly. Or, they feel uncomfortable around other people especially when problems or conflict arise. The authentic leader who brings presence into the situation has an ability to see things as they are – not what they or the others entangled in the situation may want or think it should be. They have an ease to uncover the facts from the opinions, to ask questions rather than make statements or jump to conclusions, and they keep calm and focused, no matter what distractions may vie for attention. Presence of mind allows a true leader to help them and others “see” clearly, dialog freely, choose the best course of action, get alignment, and to follow-through with responsibility and accountability. Of the people who want or need to follow them reflects the true definition of a leader, which is he/she is a leader who has followers. Rather than assume because they have the title that people will do what they say or that people should always know what to do like most people in authority feel unconsciously, the authentic leader’s presence is a positive power that is felt by others. They connect with people and have a way that immediately ushers in a sense of trust, care, openness and honesty when they are around. Their comfort in their own skin allows others to relate, participate and be a part of the solution. Rather than scare the life out of the room they bring a sense of safety and peace to those around them . Authentic leaders leave their egos “at the door” by just knowing that they are there to help others, to be of service to those in their care, whether by assisting with helpful problem-solving or conflict-resolution skills, or in providing support and guidance in areas leading to personal and professional effectiveness and growth. The present, authentic leader knows and is fully enrolled in the sense that they are there to help make the situation, company or organization better by, for and through the people at hand. Presence is the power that courses through the head, heart and soul of an authentic leader, and into the ether of the people affected. Being present doesn’t mean being perfect, or that one has risen above the challenges of being human. It does mean that those who have opened themselves up to deeper self-reflection have learned to release the conditioning that keeps them trapped in past/future thinking, and they also have developed skills in self-assessing their moods, thoughts and feelings. They have ways to bring themselves back into more peaceful, awake and open mindsets when they get triggered, and mindful people also take responsibility for their emotional ‘wakes’ and can stop or clean up their ‘messes’ as they go. While they have a vision of a better outcome, they help others find their own ways to the same goal, so that the right things get done in ways that lead to higher productivity, profitability, success, and happiness. Authentic leadership is not a noun, it’s a verb! The path to being an authentic leader begins and ends with waking up from the unconscious conditioned, reflexive self, to expanding one’s self-awareness, in being more mindful, and developing a practice of being more open and alive in one’s present moments. I have come to know that this journey is indeed the most difficult one a human can enroll, yet I know of none other more rewarding, enriching, life-affirming and loving as choosing to be a more present, more authentic person and leader. 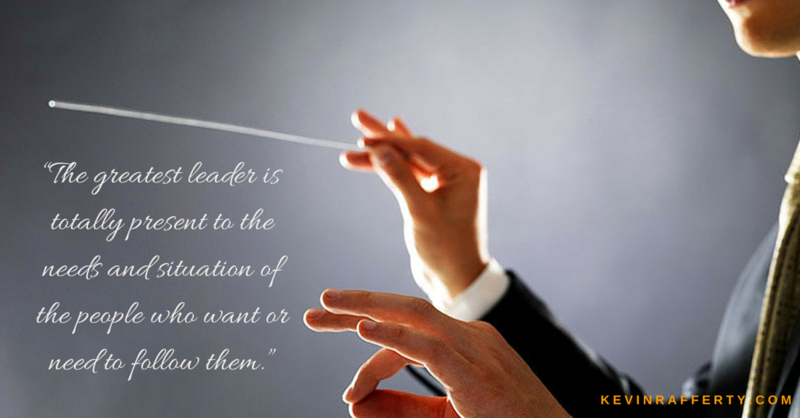 The world aches for such leadership – are you ready to accept this journey for yourself! I hope and encourage more of us to choose authenticity and presence in our personal and work lives – it will make all the difference. These is lots of buzz these days about being more mindful, of living in the present moment. Through my own experience I know when I am present, and I also know when my presence is hijacked by some past programming, old fear, worry, or an emotional outbreak. Yet when I experience presence and am practicing my mindfulness techniques, the rewards and benefits are unmatched by anything else. We have reached the limits of the old management paradigm at work, the one that has been able to engage only 31% of our employees in America (Gallop Polls). That means that with all the studies, books, and leadership training programs on how to make work and workers more productive we still have almost 70% of our workforce unengaged with their work, and many are actively disengaged, spreading toxins within our organizations. The way we have been doing what’s called “leadership” at work simply is falling way too short. We need to expand and evolve the definition of leadership, and I have found the way to do just that is by practicing mindfulness in all aspects of my life – including my leadership roles. Research shows that having an intense focus on a particular task — rather than thinking you can effectively ‘multitask,’ can make you much more productive and effective at work. We have been discovering that being mindful, or focusing in our attention to one thing in front of us, leads to significantly higher productivity, creativity, successful completion of projects, and a greater sense of accomplishment. We don’t teach mindfulness practices in schools, so a conscious leader’s greatest gift to his/her people is for them to stay in the present moment as often as possible, and to offer teaching mindfulness techniques and daily practices at work. When we as leaders are more self-aware of what’s going on inside and outside of us, we can offer such higher degrees of insight, support, trust and wisdom to our people, which leads to more engagement, stronger teams, authentic communication and better results. Companies large and small have realized the power and positive results of mindfulness training for their employees. Some of the companies that do this already include Apple, Boeing, Deutsche Bank, Facebook, Ford, General Mills, Google LA Lakers, P&G, Starbucks, Target, Toyota and Xerox. 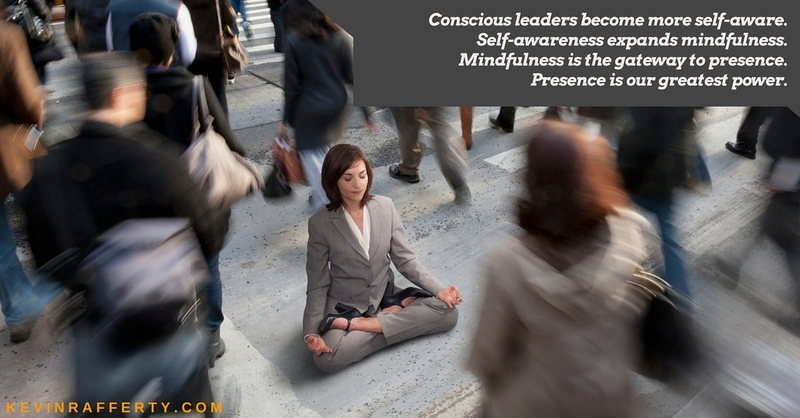 Leaders who are expanding their self-awareness are leading the way to also increase the levels of mindfulness for themselves and their people. Mindfulness and being present doesn’t need to be just sitting on a cushion and meditating. It’s really about pausing and reflecting and thinking about what is going on right now – either who or what is right before you needing your highest and best attention, or on how you are thinking and feeling internally. If we are mentally and/or emotionally “not-present,” we default into our conditioned, reactive modes, and too often create more harm than good. When we are mindful we can engage with the people and tasks at hand with more skillful means and positive outcomes. – Higher sense of peace, fulfillment and appreciation. I see a day when more leaders live in states of presence, and they are able to foster such with the people they touch. I see those leaders’ organizations achieving engagement levels double, triple than those current. I see organizations of more mindful, present people achieving heights of productivity, profitability and fulfillment that significantly out-perform their competitors. I see such positive effects when people, leaders work on themselves to truly evolve. That’s the world and the places of work I want to live in. We have a way to change, and mindfulness practices are a fundamental factor in if/how we move forward. What are you doing for your own well-being, your own self-improvement, your own authentic leadership development? 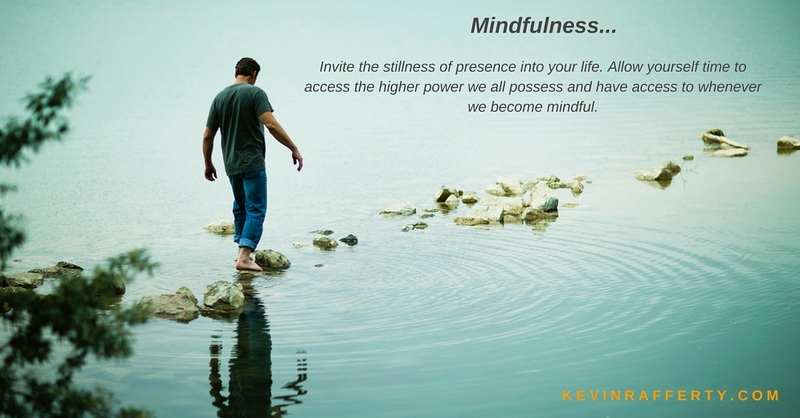 I encourage you to investigate mindfulness, and if you have any questions connect with me directly: info@kevinrafferty.com. 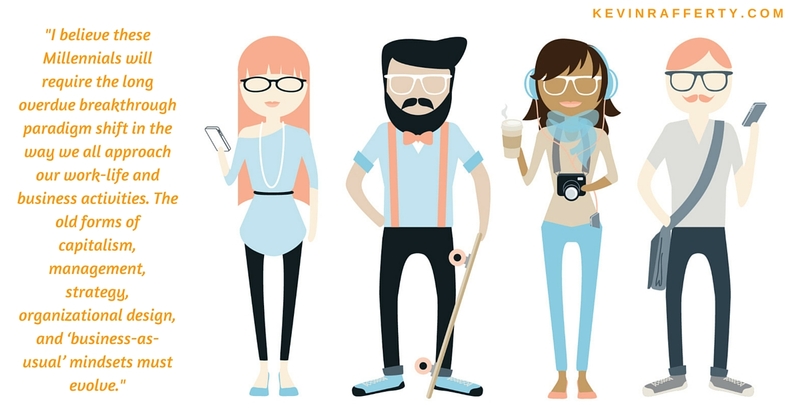 Conscious leaders become more self-aware. Mindfulness is the gateway to presence. Presence is our greatest power. Mindfulness is the gateway to presence: the state of being and living in the present moment. Mindfulness, or being mindful, is being aware of your present moment. You are not judging, reflecting, or thinking. You are simply observing the moment – this present moment in which you find yourself. Mindfulness involves bringing our awareness back from the past or the future into the present moment. By residing more frequently in the present moment, we can begin to see both the inner and outer aspects of our reality. While reflecting internally, we can see that our mind is continually chattering with commentary, judgments, and random thoughts. By noticing that our mind is continually active, we have the ability to observe carefully those thoughts, seeing them for what they are without aversion or judgment. Be aware of the voices in your head—the conditioned thought processes that run 24/7/365 ad infinitum. When we practice mindfulness, we can realize that “thoughts are just thoughts.” We are free to release a thought just by letting it go. We realize that the thought may not be based in reality, an absolute truth, or even be one with which we agree. Thus, we are free to observe life without being caught in commentary and mind chatter. We may hear the many voices or messages speaking to us within our mind. It is important to be aware that the messages we hear during “thinking” may not be accurate or helpful, but rather may be translations of, or departures from, truth or someone else’s truth altogether. I have found these following five ways to be more mindful in my day-to-day living. These tips will help you develop your mindfulness-muscles. The better and easier you can drop into being mindful, the more the present moment will offer you its deeper benefits. The easiest way to become mindful or present is by paying attention to your breath. If we can continue to come back to our breath, which always is occurring in the here and now, we will be drawn immediately into the present. Moments are like breaths. Each breath is replaced by the next breath. You are there with no other purpose other than being awake and aware of that moment. If you start by being aware of your breath, and letting go of all other thoughts at that moment, your mind and body chatter decreases. Compare our moments, breaths, to the ocean and the waves. They continue to come and disappear, to be followed by another and another and another. They come; they disappear. You will also dissipate any stress that has built up in your body just by focusing on your breath. Have a physical object to remind you to become present right now. Something that you have assigned meaning to, such as a bracelet, ring, or an object you have on your tabletop or in a pocket that just seeing or touching it is like your own personal ‘alarm-clock’ to remember to be present. Pay attention to your thoughts. Sit quietly and just observe your thoughts and any feelings they arouse. See your thoughts coming into your awareness as if they were clouds passing overhead, moving from left to right, and then out of range. Just be aware of all the random thoughts popping into your minds-eye, and do not judge or mentally comment on any of them. Just observe, and over time you see these thoughts will slow down or diminish as your awareness expands. When you are sitting, either at your desk or even while eating, simply slow down and pay deep attention to what your body is experiencing at that moment. Notice any sensations, discomforts, or temperature variations. Notice what’s coming through your senses, to scents, tastes, sounds, to the textures, and to what is received via your eyes. Just pay attention to all of it without judgement. Try to be like a child with a ‘curiosity mindset,’ just witness what you are experiencing. Get into nature. One of the fastest ways to collect yourself and be more mindful and present is to get outside. Take a walk, sit on an outdoors bench, look at a beautiful scene, and listen to the sounds of nature. Any way you can connect to nature do so, and you will find a quick way to just stop, pause, and be open to what is happening right before you in the here and now. Any activity done mindfully is a form of meditation, and mindfulness is possible practically all the time. All that is required is that we become the observer of our thoughts and feelings. It is almost like stepping just outside yourself enough to be able to turn your attention back around to see your thoughts and feelings without reaction or criticism. When we can take a moment and observe ourselves having a thought, then we are in the present moment. When present and mindful, we can choose to look at our past thoughts differently in the here-and-now. We may also choose to change the way we are anticipating the future by changing our thoughts about it right now. We have all the power, not our thoughts, and the only power we ever have is right here and now, with us, in this very moment. Mindfulness is an activity that can be done at any time. It does not require sitting, or any special process, but rather it is done by bringing the mind to focus on what is happening in the present moment, while simply noticing the mind’s usual “commentary.” Mindfulness is becoming aware of the sensations in our bodies, of the sounds around us, or sensing the presence of others close by. We can also be mindful of our mind’s chatter. Once we notice our thoughts, we can choose to stop identifying with them and their judgments and perceptions. We can choose to think another thought and if that does not serve us, choose again, and again. The benefits of mindfulness are infinite. As we more closely monitor our thinking, we can find that happiness is not exclusively a quality brought about by a change in outer circumstances, but rather our happiness often starts with loosening and releasing attachment to our thoughts, predispositions, and scripts, thereby releasing automatic reactions toward pleasant and unpleasant situations or feelings. Mindfulness, presence, leads us easily to choose happiness in any moment desired. And when we find ourselves in more positive states we are also more insightful, creative, adaptive, open, compassionate, empathetic, and easily connected to others and things around us. Presence is the condition where we know truth, right from wrong, and what to do or not to do. Presence is the power of creation, of manifestation, of successful problem-solving and conflict resolution. Presence causes ALL transformations. Invite the stillness of presence into your life. Allow yourself time to access the higher power we all possess and have access to whenever we become mindful. The second facet of Authentic Leadership is grounded in presence, in living more in the present moment. As you deepen and expand your levels of self-awareness, a most common side effect is that you are seeing things more clearly, more broadly, less ego-centrically, and are able to spend more and more time in honest self-reflection. This type of inner-work demands that you center more and more of your attention and consciousness onto the matter that is top of mind; this then manifests itself as presence, or present-moment awareness. Presence is the ability to have your full awareness in the present moment. All your mental, emotional, and spiritual faculties are focused on what is happening to you in the here and now. Being present means being completely aware of all that’s occurring in and around you, right now. It means you’re not in denial, you’re not pretending, you’re not emotionally hijacked, and you’re not avoiding. When you are grounded in the present – feeling your feelings, listening to your body, aware of what your five senses are sensing, and expressing your ideas – you are present. What does being present really mean? It means being here, completely here, right this moment, right now. It means that this now is all there is. There is no tomorrow or even a yesterday or a later today. Now is all that exists. When we harness the power of the present moment, we have our full awareness on the task at hand – on the person, people or thing right in front of us. At the heart of presence is realizing that this instant in time is unlike any you’ve experienced before or will experience again. The now is here, and that’s all there is. Being present allows your mind to be at rest because there is nowhere else to go and nothing else to do. There is no past to haunt you or pull you backward. And there is no future to wish for or fantasies to maintain. Being present is truly the demonstration of “this is as good as it gets,” because nothing is real except this very moment. And now that that moment is gone, there is only this moment, and then the next moment. Time passes, but as you remain present, you remain in the eternal state of now. The past and future are illusions. The past is over and leaves us with stories and interpretations of what we think happened. The future hasn’t happened yet, though often will deliver anxiety, worry and fear as we make up potential scenarios that most likely won’t happen. While your past can inform you and your future can inspire you, the moment of choice exists in the here and now. By relinquishing your obsession with the past and your fantasies about the future, you can tap into the power of the present, and feel the forces of wisdom, insight, compassion, empathy and love that reside inside of you. I developed the Authentic Guidance System graphic below to serve as my dashboard for my own awareness. 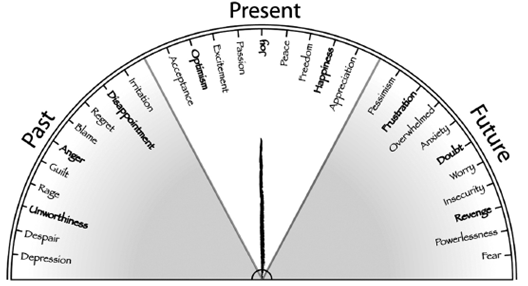 It helps me see where my present state of mind is at any time, and then if I find I am in the left or right shaded sections, I can quickly and easily bring my awareness back into present-moment states. I may not be able to jump right from fear to joy immediately, but as I focus my attention, conscious awareness onto what present-moment state that will better serve me, I literally find that I can bring that desired state of mind into my present fairly quickly, and stay there for as long as I choose. Whatever you do or create in a state of presence is of high quality. This is because it is not a means to an end, and so a loving care flows into your doing. Your passion flows more fully. Your ability to see what is truly happening and to resolve problems increase significantly. Your ability to connect with others, create trust and meaningful conversations enhances your relationships. You are more open to what is before you, and you can then help others work through issues more effortlessly and productively. You not only are better at doing what is needed, you create better outcomes – all while deepening your enjoyment factor more than ever before. 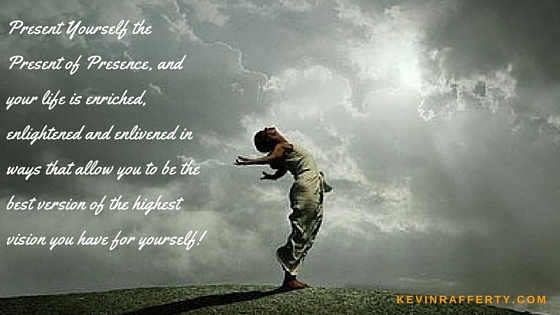 In the state of presence you are your highest and best Authentic Self! When you are your Authentic Self, you can be the highest and best Authentic Leader you desire. The times we live in are demanding better leadership, and the best leaders are becoming more self-aware and living and working more from the power of the present moment. I encourage all of us to amp our levels and capacities for presence! Present Yourself the Present of Presence, and your life is enriched, enlightened and enlivened in ways that allow you to be the best version of the highest vision you have for yourself!